Bilbao is a Spanish city, which is the capital of the Biscay province. The city has a population of 354 thousand people. Bilbao is located south of the Bay of Biscay. Remains of an ancient settlement were found at the top of the mountain Malmasín, dating from about the third century BC. This is close to where the ancient village of Bilbao, known at that time as Amanun Portus was created. Bilbao was founded in the fourteenth century. The Lord of Biscay, Diego López V, founded the town in 1300. The city was endowed with many privileges from the ruler. 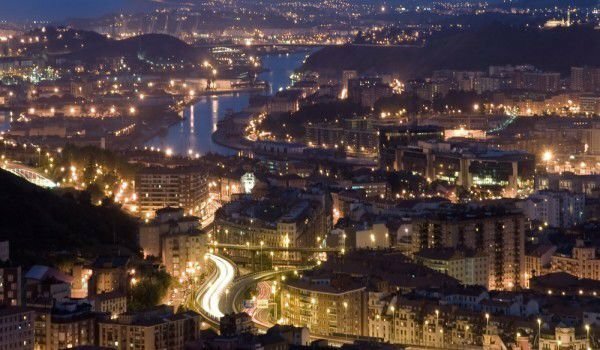 Since its inception in the early fourteenth century, Bilbao was a commercial center that has significant impact, mainly because of its port operations based on the export of iron. In 1511, the Consulate of Bilbao was created. It became the most influential institution in the city for centuries, which increasingly improved its infrastructure. Under the control of the consulate, the port of Bilbao had become one of the most important in Spain. In 1577, in the city was built the first printing house and in 1596 was published the first book of the Basques, which is called the Christian doctrine. In 1602 Bilbao became the capital of Biscay. This leads to an increase in wealth of the city and its development over the next centuries. At the end of the seventeenth century Bilbao was able to overcome the economic crisis due to the heavy mining of iron ore and highly successful trade with England and Holland. In the eighteenth century, the city was joined by other territories, as its population grows more and more. The city underwent three sieges during the nineteenth century, but all proved unsuccessful. In the nineteenth and twentieth centuries the city continued to flourish and grow. In the mid-nineteenth century the Bilbao stock exchange opened. In the early twentieth century new roads and modern buildings came up. In nly twenty years - from 1880 to 1900 the city's population increased by about seventy thousand people. The Spanish Civil War begins in Bilbao with small rebellions, suppressed by the republican forces. In 1936 the city suffered its first bombing attack. In 1937 the city was occupied by the Nationalist army. Battles continue about a month and then all the bridges over the river mouth are destroyed and the city was conquered. After the war, Bilbao again became an industrial center and the population was constantly increasing. In 1940 bridges to the city were restored. The town became famous when in 1959 there was founded the terrorist organization ETA. After the establishment of constitutional monarchy, during the transitional period in Spain, Bilbao is able to hold democratic elections. In the eighties began a period of industrial crisis because of the arrival of cheap workers from abroad and other factors. After the mid-nineties of the twentieth century the town experienced de- industrialization. Gradually it became a city of tourism, which begins with the opening of the Guggenheim. This totally changed the city's economy. They build a conference center Euskalduna and a metro network. Today, Bilbao is a city that is experiencing a strong process of economic and aesthetic revitalization. The city attracts many tourists, many of them are artists and fans arriving in town to visit the famous Guggenheim Museum. Among the sights of Bilbao is Casco – the old quarter, which is famous for its beautiful romantic market and narrow streets. The Little Museum of Fine Arts of Bilbao has gained national prominence because it has works by leading Spanish artists. The museum of sacred art also attracts many visitors. The Cathedral of Bilbao, built in 1600, is in Gothic style. To visit Bilbao and Pamplona can not be a mistake, because this is the famous place where every July there are racing bulls. You can also enjoy the beach of San Sebastian. Among the beautiful buildings in the city stands the city hall, which was built in 1892. The building has beautiful columns and balconies and an elegant staircase. The most beautiful room is called Arabian room and has a special oriental interior.